What better way to ring in the new year than with a showering of colorful confetti, accompanied by a joyous cacophony of bangs and pops? 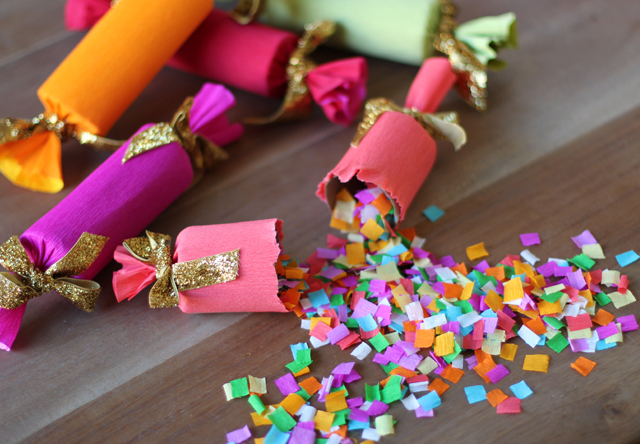 Since I’m hosting a New Year’s Eve shindig this year, I’ve started planning early by making my own confetti party poppers. How surprised will my guests be when I pass these around for the countdown to 2014! 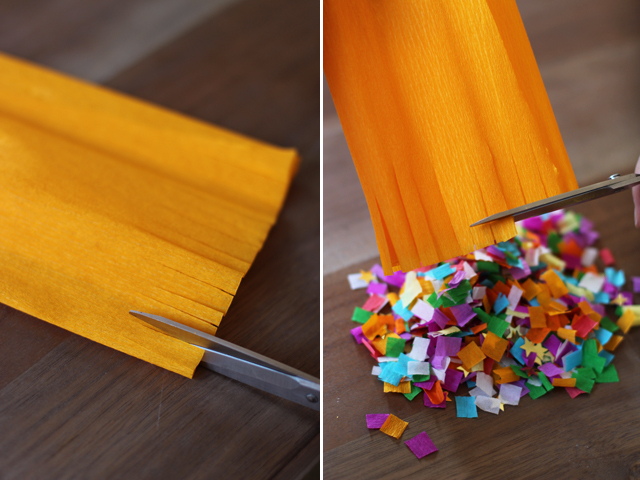 Making your own confetti is super easy. Simply cut fringe into crepe paper and trim it to create tiny little squares. I like to add in store-bought gold star confetti for extra sparkle! 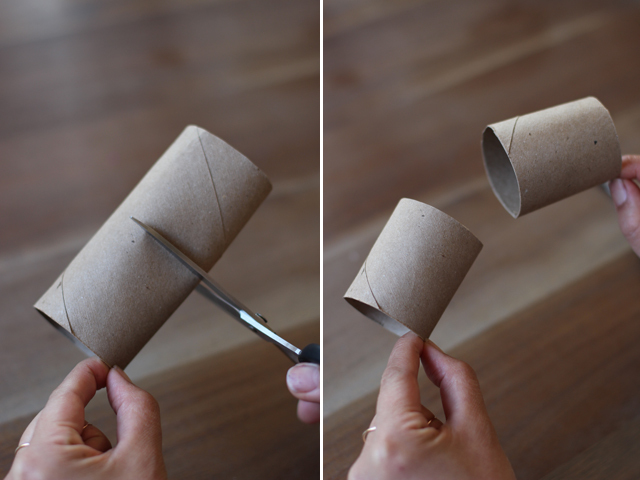 To make the poppers, start by cutting the toilet paper roll in half. 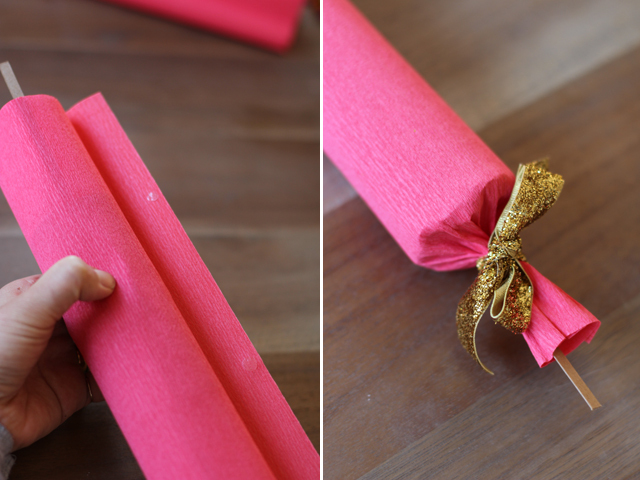 Cut the crepe paper or tissue paper into a 10″ x 7″ piece. It’s important that the paper you’re using is thin – otherwise, it will be hard to tear if it’s too thick! 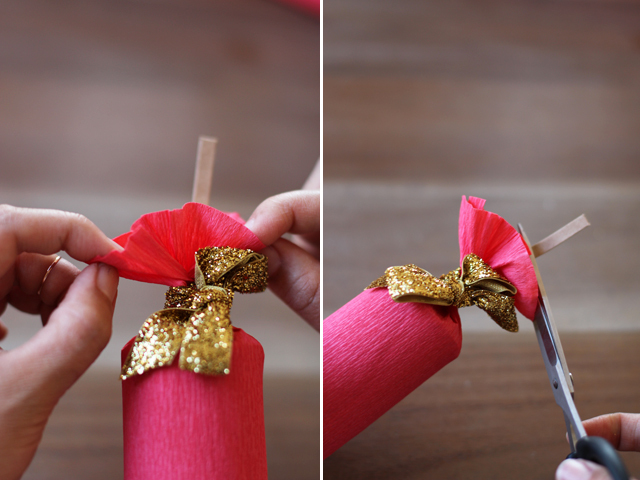 Place a cracker snap onto the crepe paper and tightly roll the paper around. 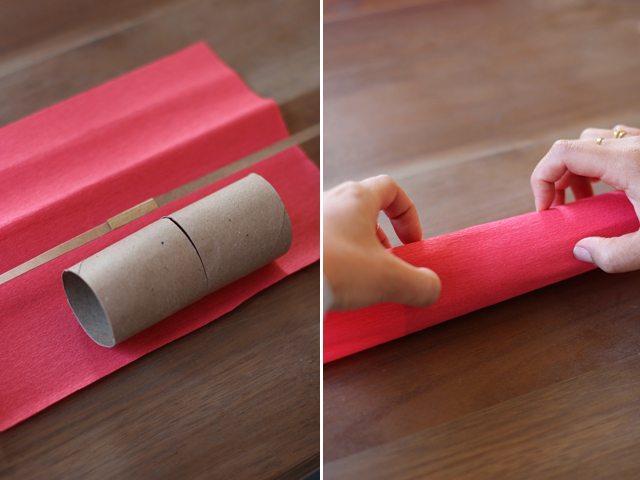 Trim any excess crepe paper and seal it with 2 adhesive dots. Tie a ribbon around one end. 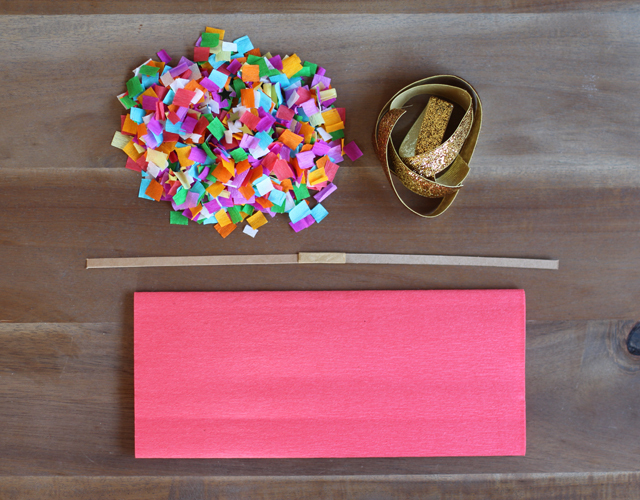 Stuff confetti into the other end until the roll is full. Tie off the other end with ribbon. Fan out the ends and trim the ends of the cracker snap. Your confetti cracker snap is finished! Pull it apart forcefully and watch it go POP!! 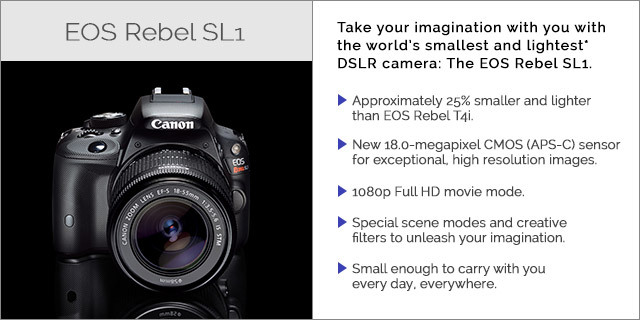 Do you know if these could be mailed in the U.S.? I would love to use this as my daughter’s new year eve save the dates!! These are such a great idea! So fun and colorful! Gotta love. I cant wait to make this for a much planned surprise party. I’m just having trouble finding cracker snaps in the US. 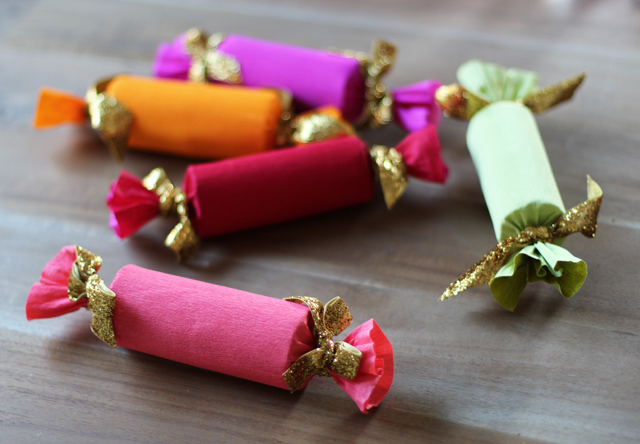 Where can you get cracker snaps? Anybody knows? Thanks for the idea though! Uhh jaaa! I am planning the decoration and little things for new years at the moment! This is PERFECT! Any ideas for my photo wall? These are so cute! 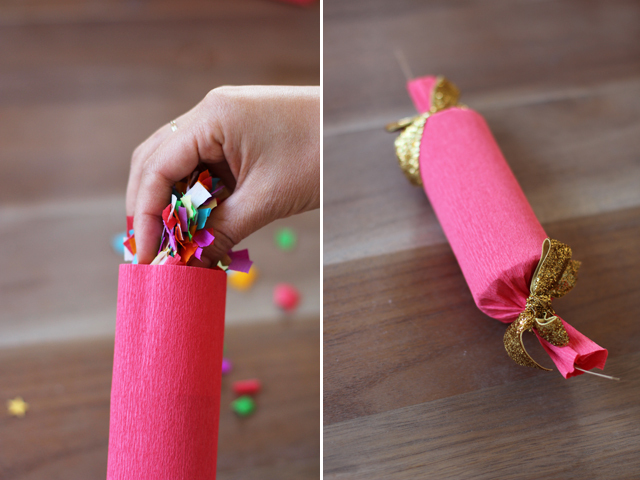 I love Christmas Crackers… and I never thought that you could make your own. Awesome. 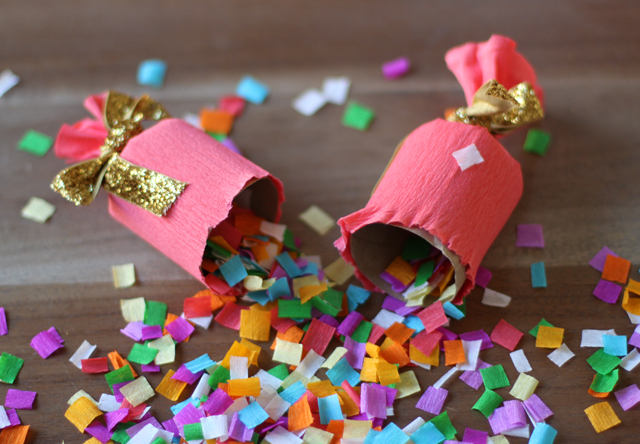 NYE Calls for DIY Giant Confetti!